My boys have always been into those books with hidden pictures or where you have to seek and find something on the page. And a couple of years ago, we had tried out an Eye Found It! game from Wonder Forge and have been playing it for years so I’m looking forward to giving Cole (9) this latest Eye Found It! game – Journey Through Time on Christmas. It comes with a 6 foot board with all sorts of fun images on it and you basically work together to discover all the hidden treasures (over 1,000 of them on this one!). It’s a fun all-family game for kiddos in the preschool and elementary school age range. 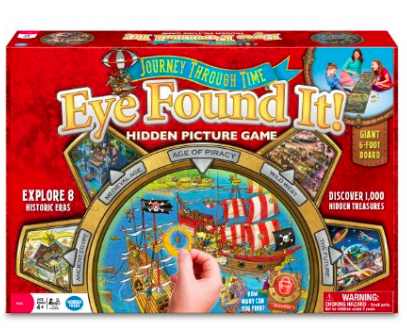 Check it out on Target if you’re looking for a last minute cute family game for under the tree: Eye Found It! game – Journey Through Time. « I Found It! The Gift For The Person Who Has Everything!